In sync with Bicycling Magazine naming New York America’s best biking city, DOT released a report this week full of stats on the safety impact of protected bike lanes. It’s the most robust data the city has released about this type of street design, and the results prove that protected bike lanes make streets safer not just for cyclists, but pedestrians and drivers as well. For this analysis [PDF], DOT looked at protected bike lanes in Manhattan with at least three years of post-implementation crash data: segments of Broadway and First, Second, Eighth, Ninth, and Columbus Avenues. These streets saw big growth in cycling and major improvements in cyclist safety. The safety benefits extended to all road users, with total traffic injuries dropping 20 percent and pedestrian injuries down 22 percent. The biggest improvement on these streets is in the diminished likelihood that a cyclist will suffer an injury — a metric DOT calls “cyclist risk.” Because injuries tended to fall or hold steady while cycling increased, most of the streets saw cyclist risk drop by more than a third. On Broadway from 59th Street to 47th Street, for example, bike volumes jumped 108 percent while crashes with injuries fell 18 percent. The best results were on Ninth Avenue between 23rd and 16th Streets, where cyclists were 65 percent less likely to be hurt after the protected bike lane was installed. Only one of eight segments, Broadway between 23rd and 18th Streets, saw an increase in cyclist risk. The report also included information DOT had previously released showing that taxi speeds south of 59th Street have remained steady since 2007, when the protected bike lanes began to be installed. Travel times for drivers on many of the streets with protected bike lanes have actually dropped as the volume of cars has remained steady, and retail sales on streets with protected bike lanes has grown faster than on comparable streets without bike lanes. DOT also noted that protected bike lane projects in Manhattan have shortened crossing distances for pedestrians thanks to planted concrete islands (where the city has added 110 trees). These are proven effective and increase cycling, and should be the minimum treatment for a major street. But only 5 new miles a year? We haven’t even finished 1st and 2nd Aves yet, and what is completed is of a much inferior design to the west side protected lanes. We also need to get serious about discouraging through traffic by cars on some main bike routes in order to really gives bikes priority. We also need to prioritize making the bridge approaches comfortable for all potential cyclists, ages 8 to 80. Has Polly Trottenberg ever rode 2nd Ave to Christie St to the Manhattan Bridge? Have the Bicycling magazine staff? A huge portion of potential cyclists would have to take the bridges, and how can you blame anybody for not doing so today, when the approaches look like Adams/Tillary/Park Row/Jay/Christie/Delancey? We know protected lanes are safe. We know they attract more users. We know that creating a network of lanes is super important. The protected bike lane map, though, is still very disjointed. 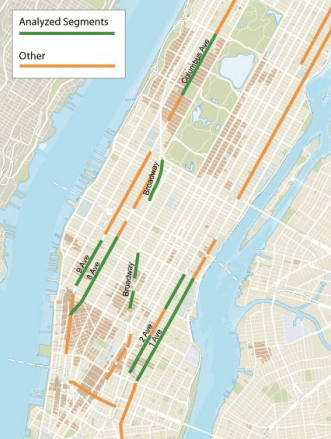 A few minor lifts by the de Basio administration to connect some of these segments could complete the transformation of Manhattan into bicycle-friendly place. Let’s do it! I’d love to see the “Cyclist Risk” metric for curbside lanes, such as on Prince Street in Manhattan or Henry Street in Brooklyn. Despite how easily they can be blocked by cars, I bet they perform better than most people think since they eliminate dooring as a factor. While the city should be putting protected lanes everywhere they can, there isn’t enough room on every street. If the city could get over its parking fetish, it could create a lot of space for safer separated transportation, increase the number of contra-flow lanes, and boost mode share in the process. Getting data on existing curbside lanes is crucial. They improve safety for pedestrians, drivers, AND cyclists. So why leave them out of the West End Ave redesign? There’s more than enough room in the plan; instead, we get extra-wide parking lanes for cars, and moving lanes even wider than status quo. Is the DOT serious about saving lives or not? I couldn’t agree more about prioritizing protected lanes on bridge approaches. Do You know why this specific bike lane ( 9th from 23rd to 16th) is safer? //First it is a residential neighborhood but portions of first avenue are also residential. It is mainly because it has split phase signals where bicyclists do not have to compete for the right of way with turning cars. Good for the cyclists good for the pedestrians. Why isn’t this treatment standard on all bike lanes? and everywhere else for that matter? I can imagine 99.999% of the population seeing this and saying “let’s do that” and one old grouch saying we’re not New York. Probably because the reducing the green phase for the motor vehicle lanes to provide dedicated green phases for cyclists would appear to reduce the level of service for motorists. And anything that appears to reduce the convenience of the street to motorists will be fought tooth-and-nail by certain groups. I can also see a 99.999% of the population seeing this and saying “let’s do that,” but then demanding they no parking be removed or green phases reduced for motorists; creating turning conflicts at every intersection. There’s always the all-directions green phasing which can not take away as much time from other phases. I can imagine 99% of the population seeing this and saying “let’s do that,” until they see the price tag and then spend the next 10 years arguing over who should pay for it. It increases the wait time for cyclists too. 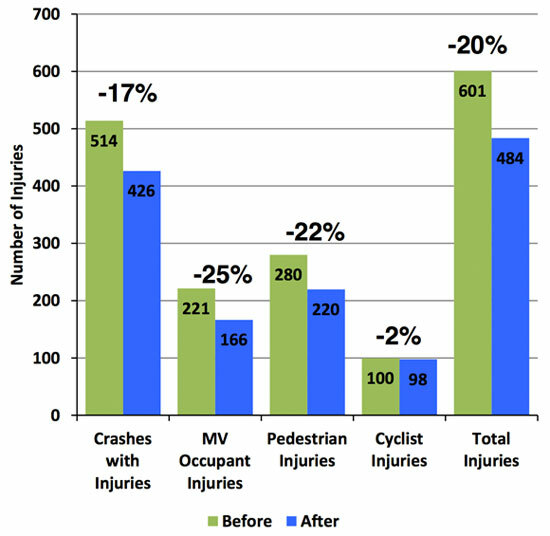 I feel like the numbers in the chart short-sell the reduction in bicyclist injuries because it’s based on raw number of injuries, rather than injury RATES. When you account for the increased bicycle ridership associated with protected lanes, the reduction in bicyclist injury RATES is much more drastic than 2%. DOT installed 25 miles of protected bike lanes in 2017, the agency announced today, with much of the growth consisting of new two-way protected lanes in Queens. In a new report, Transportation Alternatives makes the case for closing the gaps in the Second Avenue protected bike lane as soon as possible and lays out a design concept for the tricky approach to the Queensboro Bridge. The redesign will narrow crossing distances 26 percent, add painted pedestrians islands, and provide physical protection for the Ninth Street bike lane.